Last year Playmobil revealed its first official hockey line featuring actual teams from the NHL, but disappointingly it was limited to just the league’s original six franchises. A year later, the toymaker is finally introducing 12 additional teams to help fill out your kid’s miniature league. Joining the Bruins, Blackhawks, Red Wings, Canadiens, Rangers, and Maple Leafs this spring are the Calgary Flames, Edmonton Oilers, Los Angeles Kings, Minnesota Wild, New Jersey Devils, New York Islanders, Ottawa Senators, Philadelphia Flyers, Pittsburgh Penguins, Vancouver Canucks, Washington Capitals, and Winnipeg Jets. 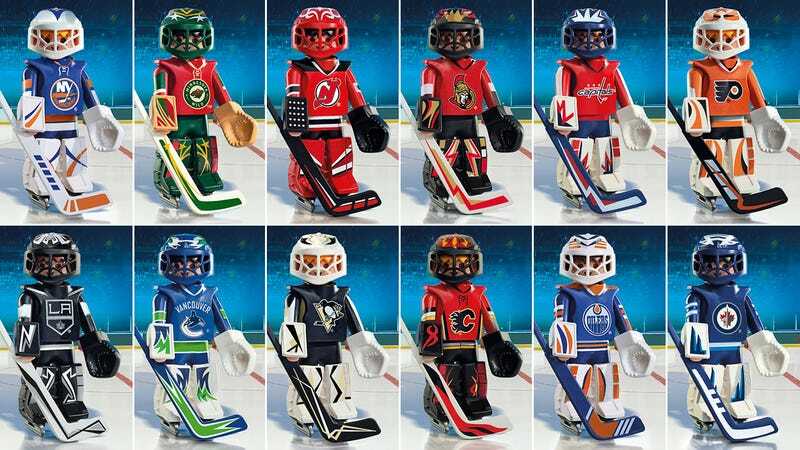 Each team will be represented by a goalie and player figure compatible with the existing Playmobil NHL line and accessories, including the hockey rink playset. And while that’s still about 12 teams short of the entire league, it’s safe to assume that eventually every franchise will get the Playmobil treatment.